There are a lot of ways to enjoy whiskey. In fact, we might go so far as to say that there are no wrong ways. We may prefer our whiskey straight, but we’re always up for a nice, well-balanced cocktail. Increasingly though, we’ve been playing around with bourbon and beer pairings. Matching Angel’s Envy with the right beer can create some pretty surprising effects on the palate. As you sip the beer, then the bourbon, the complex flavors of each beverage can unlock or highlight some occasionally startling notes that you’d never expect. It’s a really entertaining sort of alchemy that we strongly encourage you to explore. We’ll be featuring three beers (that should be available at a liquor store near you) to give you a starting point for your own experiments. We recommend only trying one pairing at a time or spacing them out—it’s easy to burn out your taste buds. 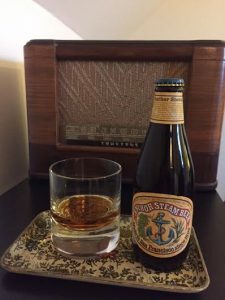 As far as lagers go, Anchor Steam offers a bolder flavor that comes from a combination of pale and caramel malts. It’s a lighter, simpler—but delicious—beer that’s a great choice for establishing a flavor-pairing baseline. When you take your first sip of the beer and follow it with Angel’s Envy, you’ll notice an intense sweetness that fades into a pleasant lemon acidity. Also, you’ll really notice Angel’s Envy’s port finish. Taste the beer again after the bourbon and the sweetness is mellower with subtle notes of honey and vanilla. Overall, this is a great choice to start out with. Next up, we wanted to find an IPA that would be a good match for Angel’s Envy. After a little (fun) experimentation, we decided on Firestone’s Easy Jack. Dry hopped with hops from North America, Europe and New Zealand, it’s a surprisingly well-rounded and accessible IPA. 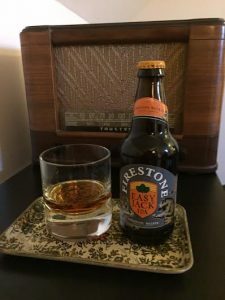 After your first taste of the beer and Angel’s Envy, you’ll experience a nice, buttery mouth-feel that’s balanced out by a strong oak flavor and a mellow burn. When you go back to the beer, all of the IPA’s flavors are intensified and remarkably crisp. It’s a really fun combination of contrasting flavors, and this might have been our favorite pairing of the three. When we decided on Breckenridge Vanilla Porter, we wanted to try a darker beer that featured some of the same flavor notes found in Angel’s Envy—namely vanilla and bitter chocolate. 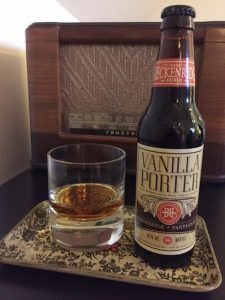 After tasting both (beer first), the vanilla definitely comes through, but behind that are stronger notes of Angel’s Envy’s port finish, which are particularly warm and lingering. When you try the beer after the whiskey, the vanilla is hardly noticeable (strangely), and bitter chocolate and coffee flavors are very prominent. Of the three pairings, it was a good way to end and an excellent dessert option. Let us know what beer you enjoy with your Angel’s Envy and we’ll check it out. Cheers!